Follow me here. I was thinking about some of the old Christmas specials that were made in the 1960’s. That led me to a mental picture of an abominable snowman and an igloo from the 1964 stop-animation of Rudolph the Red-Nosed Reindeer. Now I honestly don’t know if the snowman had an igloo or not but that got me thinking about real-world igloos and where they exist and then somehow – don’t ask me how – I was transplanted to the thought of a high-walled tent in the Adirondacks. So that got me thinking about platform tents and what I have always called Adirondack tents. They always caught my eye in the Cabela’s camping catalog. Remember? They were heavy duty canvas tents that had a wood burning stove with a chimney and big door flaps, etc. All of that to say I have read dozens of articles and stories now on the history of tents. Perhaps it should first be established that yes, tents are portable structures by nature. In fact, they are the ultimate in mobile housing. The oldest known tent, found in Moldova (an Eastern European country) was built using mammoth bones as structure framing and what anthropologists think to be mammoth hide and game fur over the frame. It is said the tent can be dated back to 40,000 B.C. and was likely used by Neanderthals crossing the Bearing Strait. As with all nomadic people, the tents were created in order to adapt to the lifestyle and environments of the people they protected. Just before the birth of Christ it was documented in the Bible that people of ancient times used tents for nomadic dwellings of all sorts: agriculture, military, pastoral, etc. 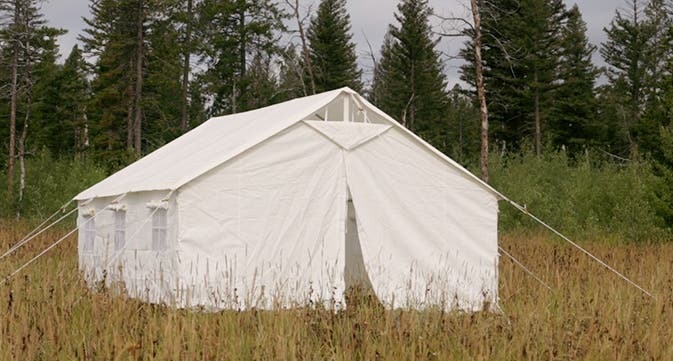 Isaiah 54:2 reads, “Enlarge the place of your tent, stretch your tent curtains wide, do not hold back; lengthen your cords, strengthen your stakes.” At some point just before the birth of Christ near Asiatic Turkey, yurts and roundhouse tents took precedence over the more familiar A-frame style. In fact, Greek historian Herodotus (484-425 B.C.) recorded the first written description of a yurt. According to Herodotus, the tents were used as dwellings by the Scythians, a nomadic group who occupied the Caucasus region located at the border of Europe and Asia. A traditional yurt is best described as a portable, round tent covered with skins or felt and used as a dwelling by nomadic people groups in Asia. What is interesting about this transition to yurts is that while they were made almost entirely of expanding wooden circular frames covered by felt from the wool of sheeps, no trees existed in the area of Asia they were originally most popular in. That serves to reason then that either another people group used yurts first and had developed a different sort of skeleton system or the Turks bartered with other people groups to obtain the timber framing. After Christ was born Romans employed the use of A-frame style tents to house military units when deployed to battle. 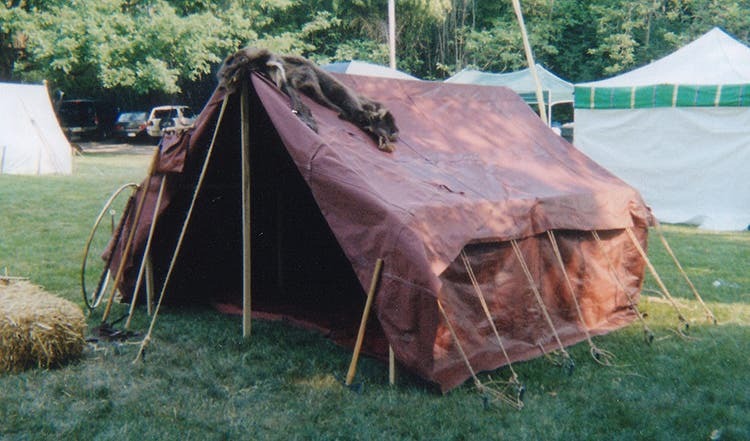 Constructed of calf skin and held up by tight lashes or ropes, the tents were easy to assemble and break down. They can most easily be compared to more modern bush canopies. As time has marched on, tents have changed. They have become smaller, lighter, and easier to pack. They are now nylon or some other synthetic material and are rarely designed for more than a 4-person family. But they have a rich history and one that is still available if you just pull back the flaps and have a deeper look. What brand tent is the one at the top of your article? Thanks.